The Congress Run will take place on Friday, 17 May 2019 at 7:00 am before the sessions start. All delegates, family and friends are welcome! The run consists of a warming up of about 6 minutes, a dynamic workout, the course (5 km) and a final stretch. The entrance fee is 5 EUR (including a t-shirt) and will be donated to Juliana‘s Children‘s Hospital, The Hague. For registration, please click on the button below. Meeting day and time: Friday, 17 May, 6:45 am. The Congress Organisation Team will welcome all runners and hand over the t-shirt. Running leaders will informe the group about the course and the rules of the run and also guide the runners in the front, middle and back. 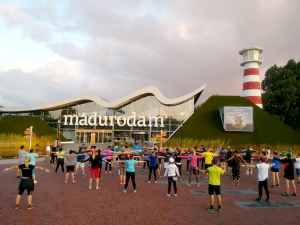 A photographer will take pictures before the run as well as a group picture after about 3,5 km in front of the Peace Palace. Back at the Hotel Novotel Den Haag World Forum, all runners will get a bottle of water and a fruit.